Doug grew up in Berea, Kentucky, “where the bluegrass meets the mountains. His parents taught chemistry and music at Berea college. Doug went to Earlham College, a Quaker-affiliated liberal arts school in Indiana, and became interested in biology and dance, which he pursued both during graduate school at the University of Wisconsin. Doug’s advisors (Tim Moermond and Julie Denslow) brought him to Costa Rica, where he spent almost two years doing MS and PhD research at the La Selva Biological station, back when it was accessible only by boat. In Madison, Doug played guitar and banjo, and met his wife, Lisa. His current hobbies include fishing, birding, gardening, and collecting antique duck decoys. He and Lisa have two daughters. RAP staff walked through Doug’s draft PowerPoint presentations, offering pointers and clarifications, and adjustments to make the presentations appropriate for specific audiences that Doug spoke to or wrote for, based on established contacts and experiences. RAP staff also helped Doug distill a statement of his primary research interests. 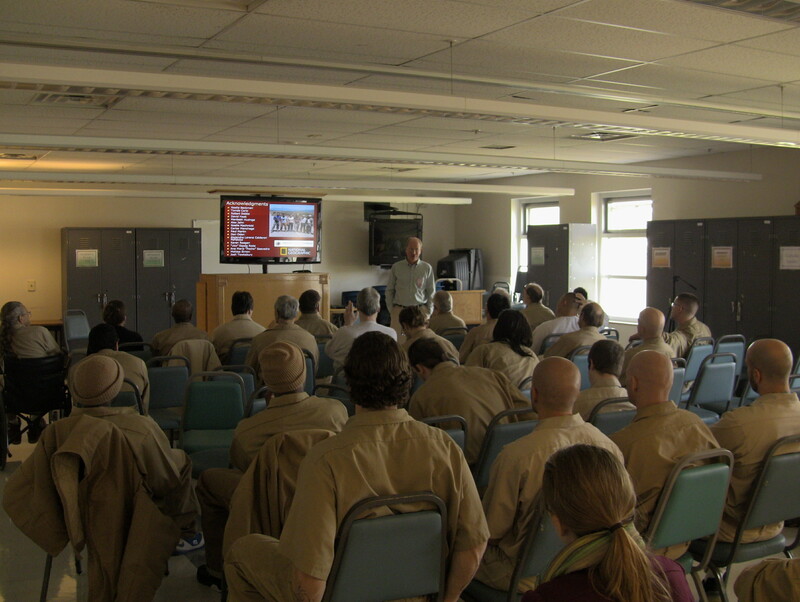 In partnership with the Sustainable Prisons Project, Doug spoke to 40 offenders and staff at the Stafford Creek Corrections Center. Doug described how chilies have evolved, with spiciness serving unique roles in deterring seed consumption by predators. 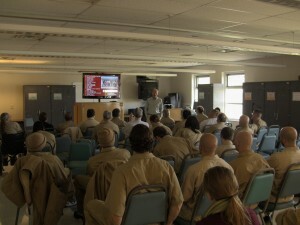 The inmates demonstrated a high level of understanding of the ecology discussed as they probed into the life cycles of chili plants, characteristics of plant growth, and predatory behaviors of birds during the question and answer period. During his visit, RAF staff helped Doug contact local moving companies to explore concepts of migratory patterns. The rationale for this contact is that just as birds migrate to other areas in search of food, Americans migrate to other areas in search of employment or family proximity. Doug had a very successful conversation with representatives of U-Haul, which may lead to the widespread distribution of interpretive material about migratory birds nationwide. In addition, Doug spoke at a local culinary store, Buck’s Fifth Avenue. The audience included local citizens, employees of the shop, and culinary enthusiasts. By describing ecological roles of common spices, Doug could readily connect to this culinary audience. 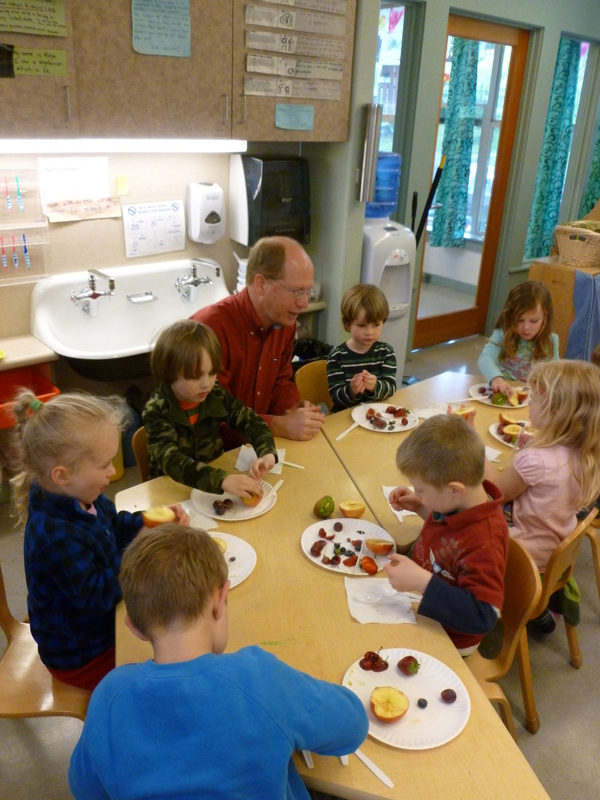 With Doug Levey, the children of The Evergreen State College Children’s Center performed surgery on plums, apples, cherries, strawberries, blueberries, and grapes, finding the fruits hidden within. With Doug, the children began developing an understanding of fruits providing seeds, and seeds generating new plants. Doug presented his work to a group of faculty, students and staff at The Evergreen State College. By quickly transitioning between the presentations to offenders and faculty, Doug developed a sense of the need to adapt presentations to the audience. As a senior scientist, Doug is a strong mentor to junior scientists in his lab and local elementary school children, via his National Science Foundation funded GK-12 program. However, with the Fellowship, Doug deepened his confidence in brainstorming and developing outreach opportunities with truly non-traditional audiences. By initiating contact with moving companies himself, Doug also experienced firsthand how outreach efforts can readily click at times, with unforeseen opportunities arising.